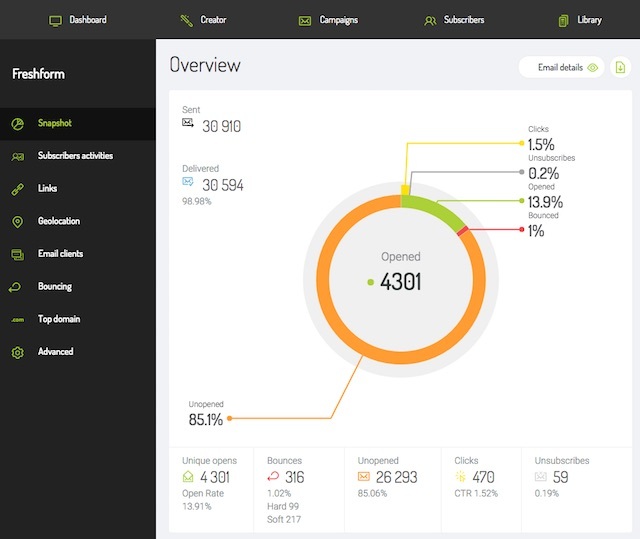 Every effective email marketing software program, in addition to its basic role of sending your campaign, should give you access to a reporting system that gives you insight into the details of how the campaign is proceeding. FreshMail's reporting system gives you the possibility to see very detailed metrics that show how your subscribers are responding to your message. Let's take a look at what information FreshMail provides and how you can use it to optimize your online marketing campaign. The moment your campaign is sent, you have access to feedback about the actions of your subscribers. The Overview provides statistics about the number of messages opened, the number still unopened, the number of times a link in the message has been clicked, the number of unsubscribes and the number of message bounces. 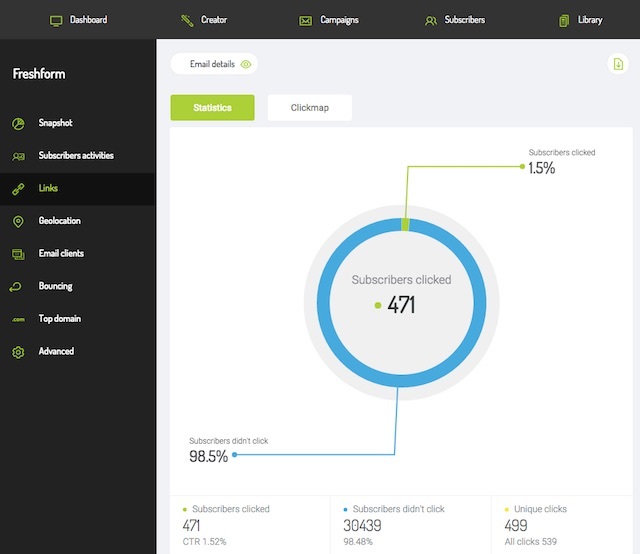 In addition to the basic information contained in the Overview graphic, FreshMail's reporting system gives you a window into your subscribers' behavior in other ways as well. Here's a list of other ways you can track the response to your messages in FreshMail's reporting system. Who clicked on your link and who didn't? 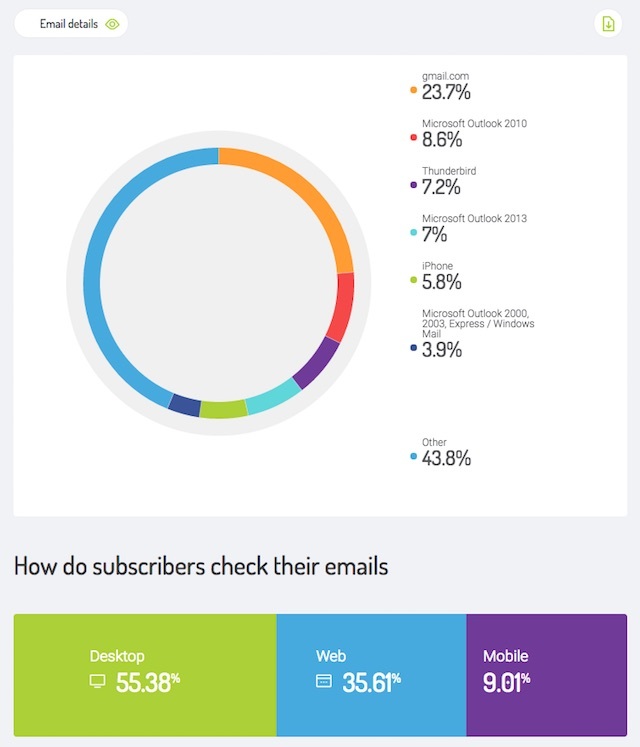 How do you know how many subscribers clicked on the link you included in your last email? Easy. On the 'Reports' page, just click on 'Links' on the menu on the left. Here you'll find a graphic representation of the portion of your recipients who did and did not click on the link or links in your message. At the bottom of the page you can get information about the total number of clicks, the number of unique clicks and even a list of addresses that clicked on a particular link. In addition to this, you can also check the Clickmap (just next to the 'Statistics' icon), which highlights the individual links on the message that you sent. Just mouse over the link in the message to see what kind of response the link is getting. The FreshMail reporting system is also equipped with a geolocation module. This allows you to track the response to your message by geographical region. Paying close attention to this will allow you to better segment your subscriber list for personalized or relevant offers in your future campaigns. Did you include icons with links to your social media pages in your email campaign? Click on 'Social media' in the menu on the left to see how many subscribers clicked on the link. The reporting system also provides statistics related to the rejection, or 'bouncing', of your messages. As a reminder, there are two types of message bounces. A 'soft' bounce happens when your message was not delivered because, for example, the subscriber's inbox was full or the message could not be delivered for technical reasons. 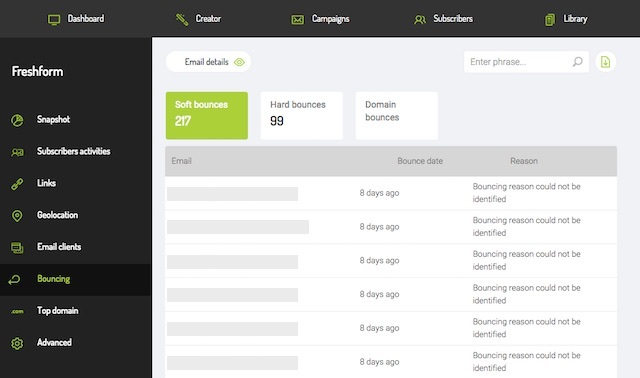 A 'hard' bounce is when your message was not delivered because the the subscriber's address does not exist. Where are your subscribers getting your messages? FreshMail also gives you the possibility to check the domains in which your subscribers access their email inboxes. On top of that, you can also check in which email software your email message was opened. Remember that each client and email software program has its own requirements regarding the structure of the HTML code. Creating a message in line with those standards ensures the proper display of the message. Take a look at the 'Email clients' and 'Most popular domains' tabs on the menu on the left to see where your subscribers are accessing your messages.